A government scheme that encourages individuals and companies in Shanghai to recycle their garbage is to be extended, officials said yesterday. 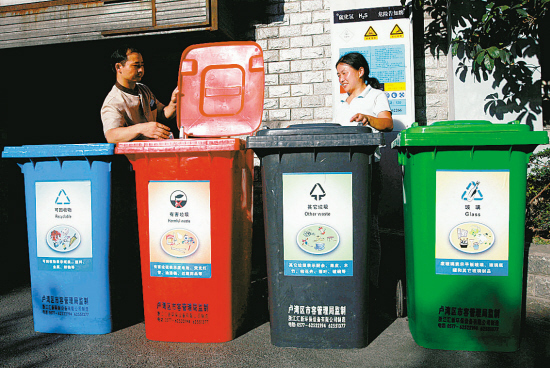 Communities in Shanghai's Huangpu District are equipped with recycling bins. Following last year's trials involving 2.05 million households and nearly 7,000 businesses, the Shanghai Greenery and Public Sanitation Bureau told a press conference it will this year roll out the scheme to a further 400,000 homes while also completing the construction of 2,000 waste recycling centers. As well as announcing the extension, the bureau issued a warning that anyone involved in the scheme could from next month face a fine for failing to properly sort their garbage. "But we hope to change people's habits via education rather than by punishing them," bureau official Tang Jiafu said. Gu Changhao, deputy director of the city government's legislative affairs office, agreed, saying officials will avoid issuing fines in the early days of the scheme, but that they will have the option to do so later. Under the official guidelines, individuals who fail to properly sort their waste can be fined up to 200 yuan (US$32.25), while companies face penalties of between 100 yuan and 1,000 yuan. Fines are also possible for property management firms that do not provide the appropriate bins for collecting waste, and transport companies that fail to keep sorted items separate after collection. The scheme divides domestic garbage into four categories -- recyclable materials, harmful items, and wet and dry waste. According to a survey conducted in November by the Shanghai Statistics Bureau, one of the biggest obstacles to the garbage sorting scheme is the lack of clarity on the subject. The study polled 2,000 householders (1,500 of whom were involved in the trial), 200 cleaners and 100 people employed by neighborhood committees. While 26 percent of people said they "always" sorted their garbage, and 57 percent said they did so "most of the time," there was still a lot of misunderstanding as to what constituted wet and dry waste. While more than 60 percent of people said the government should accelerate the garbage scheme, 32 percent said the plan shouldn't be rolled out until there is clearer information. Tang said that despite the new rules, the government has no plans to charge people for garbage collection.